I’ve been in a chutney/pickling frenzy. Thursday I made a chutney of Angelina plums, red flame raisins, red onion, and jalapeños. The problem with jalapeños is their huge variation in hotness. I used six big ones in this batch, and yow! I got the plums Wednesday from Erik Scheltewitz at his booth at the Civic Center Farmers Market, and after I’d paid he threw in half as many more as a bonus. I am perhaps Erik’s most long-term customer, as I started buying oranges from him on his first trip to the San Mateo Farmers market when it was at Fashion Island back when I had just started working at Oracle and Erik and I were both buffed. It was literally his first day because both he and his oranges, which is all he brought back then, were such perfect farm-fresh produce that I would not have missed either had they been at the market before. The past dozen years have not been kind to either of us although his only excuse is marriage to a good cook. But anyhow, since I had the extra plums, I stopped at another vendor on the way out and bought a bunch of nectarines and Friday morning made a half nectarine and half plum chutney… with golden raisins and yellow onion and seven of those jalapeños. Double yow!! Friday afternoon, I pickled the cute little okra I had got Wednesday. Saturday morning at 8:00 A.M. I was at the Ferry Plaza Farmers Market for my usual coffee with Sybil, especially excited because the only vendor out here who does pineapple guavas had told me he’d be bringing his first ones in. Their season is only three weeks, and they make the best chutney of any fruit I’ve used so far. As it turned out, I had misunderstood about the pineapple guavas as they’re still two weeks out, but what I did find at Tierra Vegetables was the most enormous tomatillos I’ve ever seen. As I was stuffing a bag, Sybil asked, “What are you going to do with them?” and I realized that I hadn’t thought that far ahead. They were simply too gorgeous to pass up. And after that at Blossom Bluff when I dropped off a jar of the chutney I’d made with their Flavor Rich pluots, they pointed out that they had their first Damson plums and gave me a bagful. I was going to make a chutney of them but decided I’d just jam them. Two quarts plums, one quart sugar, one apple, and the juice of one lemon. Simmered into mush with a little help at the end from my stick blender. The tomatillos I put into a chutney this morning with some nectarines, three jalapeños, and a pimento that Lee gave me. I cut back on the spices to better highlight the tomatillos, using only cinnamon and mace. Oh, and it’s only three jalapeños because that’s all I have and also because I finally made Sybil cry Uncle. 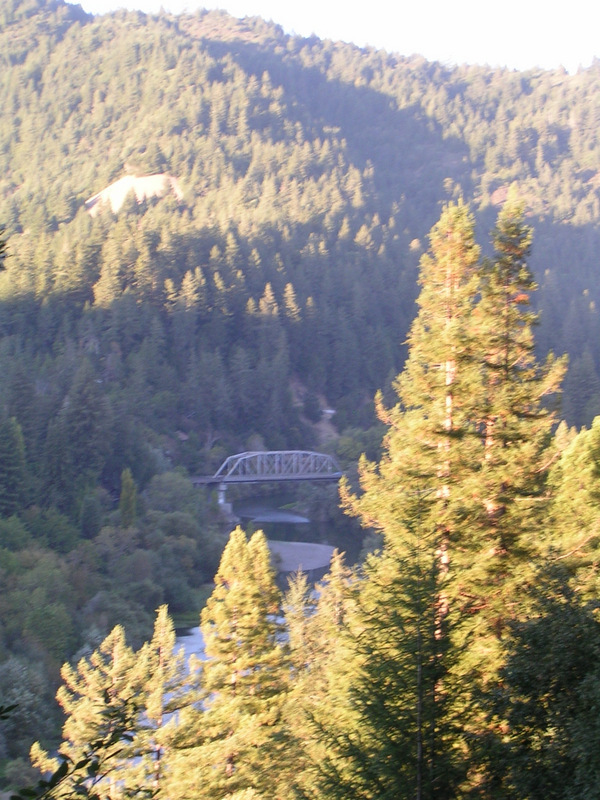 Here’s a telephoto view from a hilltop south of Forrestville of the Hacienda Bridge over the Russian River.